Supplied as a set of four, complete with CA-8 three button controller and 3 XLR cables, the Dynamo scan is an ideal effect for the small to medium sized disco roadshow. Ten combined colour and gobo patterns, including some with split colours are combined with fast moving mirrors to produce a range of stunning effects. Each scanner is provided with a manual lens for focusing the beams in order to produce sharp projected images. Although each light source is only 100 watts, the optics mean that the output is deceivingly bright and because of the focused nature of the scanner effect, the Dynamo is capable of holding its own when used together with moonflower or barrel effects with more powerful lamps. Considering purchasing the Acme 100w Dynamo Pack? Have questions? Ask people who've recently bought one. Do you own the Acme 100w Dynamo Pack? Why not write a review based on your experience with it. 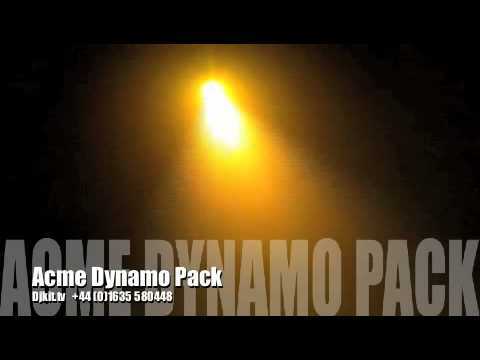 Seen a video for Acme 100w Dynamo Pack online or have you own video? 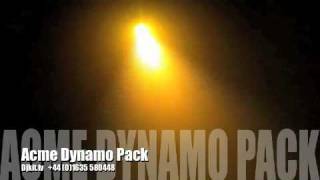 Check out Acme 100w Dynamo Pack on DJkit.com!